Hundreds of convictions may need to be re-examined after a landmark Supreme Court judgement found that a man found guilty of murder under the controversial “joint enterprise” principle should have his murder conviction quashed. The man, Ameen Jogee, was convicted after the jury in his original trial believed him guilty of encouraging the killer, Mohammed Hirsi, who actually struck the fatal blow – even though Jogee was outside the building when the murder occurred. Jogee will not be released because his manslaughter conviction remains. But the court judgement blows apart the premise upon which the “joint enterprise” principle, defended by successive governments as a central plank in tackling “gang violence”, has rested. The ruling is likely to have implications for many existing joint enterprise convictions. An investigation by the Bureau of Investigative Journalism uncovered that 479 so-called “secondary parties” were convicted of joint enterprise murder between 2005 and 2013. Pressure has been building upon the principle of joint enterprise prosecution since at least 1993, when the Law Commission consulted on whether such prosecutions were “unsound in principle”. In the years that followed, the police and Crown Prosecution Service had begun to collaborate with joint enterprise prosecutions in order to sidestep a number of difficulties they faced bringing gang prosecutions. Subsequently, in a 2007 report on collective participation in crime, the Law Commission recommended a particularly limited interpretation of joint enterprise, but still the government declined to act. The House of Commons Justice Select Committee twice recommended abolition of joint enterprise in 2012 and 2014; but, in turn, justice ministers Kenneth Clarke and Chris Grayling defended the pragmatic utility of the law. In 2010, a campaign organisation JENGbA (Joint Enterprise – Not Guilty by Association) was formed to fight for the law’s repeal and now represents some 600 people convicted under the law. Central to the Supreme Court’s argument in setting aside the 2011 joint enterprise murder conviction was the way that this aspect of judge-made Common Law has evolved, over time, from case to case and circumstance to circumstance. According to the five Law Lords in the Supreme Court, the courts have been misconstruing the law, and judges have been misdirecting juries regarding crucial interpretations of “criminal intent” and “foresight”, for more than 30 years. The law has its origins in laws to deter the practice of duelling and therefore criminalised both the “duellist” (who may have fired a critical shot) and their “seconds” who ought to have had reasonable foresight that a serious injury would result. Yet, as recent critics have argued, there is a world of difference between “foreseeability” and whether any given person actually foresaw the eventual, fatal, offence – let alone whether they contributed to it. In recent years, influenced by copious amounts of police evidence regarding “gang affiliations”, juries appear to have been more readily persuaded that so-called “gang involved” young people ought to share in the culpability of their friends and associates. One of the most famous cases, Derek Bentley and Christopher Craig from 1952-3, saw Bentley convicted and eventually executed after Craig had shot and killed a police officer during a burglary attempt. Craig, aged only 16, escaped execution. Bentley’s conviction was posthumously quashed in 1998 after a prolonged campaign, but the essentials of joint enterprise law were retained. Following the upturn in gang-related violence, during the 1990s, and the incorporation of a similar principle of “collective liability” within the Domestic Violence, Crime and Victims Act 2004 joint enterprise came to be mainstreamed in the government’s tackling gangs strategy. It is here that another invidious aspect of the law becomes apparent: joint enterprise is used to tackle gang related violence, yet the label “gang-related” violence is employed disproportionately when the perpetrators are black. 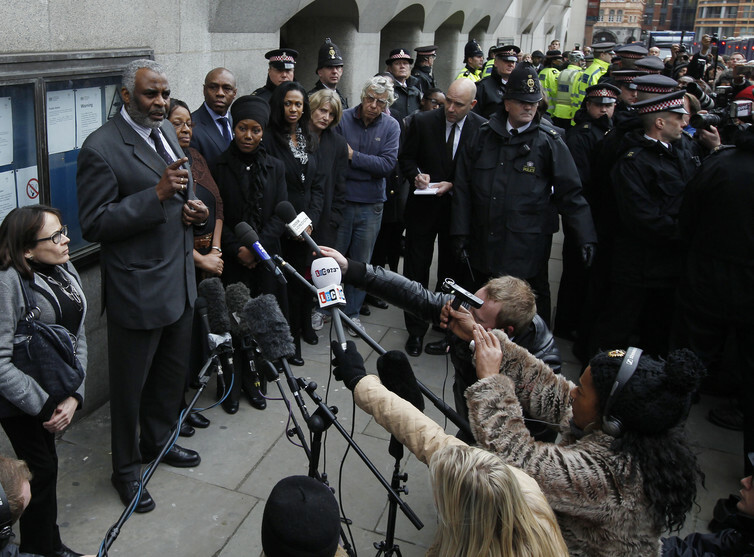 Neville Lawrence, the father of Stephen Lawrence after the 2012 conviction of two men for his son’s murder. A joint enterprise prosecution was eventually vital to the prosecution of Stephen Lawrence’s killers. Yet there is some irony that the current targeting of many prosecutions has the discomforting look about it of “institutional racism”, Lord Macpherson’s original complaint about the Metropolitan Police in the wake of Lawrence’s murder. Of course, the recent Supreme Court judgement is unlikely to change all of this, even though the court’s rejection of a threshold of culpability drawn too loosely and too low may prompt a number of appeals. These will only, ultimately, be resolved on the evidence. The substance of joint enterprise is likely to remain, unless the government is persuaded, finally, to do what the Law Commission and the Justice Select Committee have been arguing for some time and fundamentally reform the law. Tagged conviction, joint enterprise, landmark judgement, law commission, Peter Squires, secondary parties, Supreme Court, The Conversation. Bookmark the permalink.